I bet they are delayed AGAIN and haven't communicated it yet. I don't think anyone got an email. I am unfortunately getting the same feeling @travis1409 though I really hope that's not the case. Another delay at this point would be very disheartening. No issues with production AFAIK. Stay positive peeps! Any news on when the 2nd batch (OCT batch) emails will get sent out? The tiny child in my soul is hoping right at the start of Oct haha. Ya i have not heard of anyone getting an email yet, which as i said is a bit disheartening. Hopefully soon. Please! soon? As for the shipping, it was outlined on day one of the kickstarter that the shipping would be billed to us when the the Omni was shipped. I would never expect them to do what Oculus did and waive the shipping cost, though that would be nice. The Omni and Vive box's weight no more then 5 pounds. The Omni is huge and weighs 100 pounds! that's a fright deliver, that is considerably over the max size that FedEx, DHL or UPS will ship. If Virtuix sticks to the prices they outlined in the kickstarter I would be willing to bet they are subsidizing the shipping costs already. Ya I'm not too worried about the shipping cost "USA: $90-$150" according to Virtuix it'll be around that but with this wait and all the delays it would be nice to give the backers a little something extra to compensate. I'm hoping we hear something soon as I've heard nothing about anyone getting their emails and there is only 2 1/2 days left in September. I'm still hopeful the Oct batch isn't delayed or put out this late in Oct(early to mid Oct would be sweet). starting to look like maybe there might be an issue unless the emails have been sent and everyone getting them just isn't saying anything about it, which sounds highly unlikely. I image we would see at least 5 or 6 posts of "WHOOOO GOT ME EMAIL!!!" Hopefully nothing to serious. Still no issues with production - don't worry guys. As for emails, I don't know how many are going out or when. Bear in mind the first shipment volume will be low, and it will take time to arrive - ocean freight from China takes a few weeks. I know the wait is agonizing, especially when you're expecting an email but don't know when. Just check your emails once a day, not every few minutes would be my advice! Not to be difficult, but the original order I placed said that I could avoid shipping costs by picking up the unit locally since I live in California. Whatever happened to that option? @flamaest - well, the first email is to confirm your shipping/order info, the second is to confirm your payment, and the last gives you the shipping number to track your order with, so you should be able to make some sort of mention when you reply to the first email, once you actually get it. Just as an extra note. I received an email yesterday about the omni connect software being made available for the production model Omnis soon. (specifically warning not to use it if you have a pathfinder Omni) There is no mention about any shipment progress, but I can only imagine that the software being made available means that Production model Omnis are expected to be delivered soon as well. How soon is soon? I have no idea, but I wouldn't personally expect Virtuix to start pushing out their software unless they already had the initial shipment in hand at their main US facility. @Rabid @travis1409 @DanteM @xxann5 - well, just in case people missed it (or skimmed) the latest production update mentions that the units scheduled to ship in September have indeed shipped. However as I had expected, this shipment is FROM China to the US, not from the US to the consumer. Virtuix lists their estimated arrival for the first units to be in November, so the reason no one has mentioned getting emails is because that part wont be coming until then. It looks like Xmas is Virtuix's current aim, hopefully they will be able to get both the first and second batches out in time for that, but it looks like there's the strong possibility that many kickstarters will have to settle with getting the email as their Xmas present, rather than the omni itself. Still, things are moving forward, and that's good to know..
@GreyAcumen Yes, this is the long 'shipping' part I'm afraid. Once it gets to American shores, it will be 'roading' - that should be a lot quicker! Hopefully Europe won't be too far behind. Well backers that are in the US and within the first 1000 such as myself should have theirs long before Xmas. Since they are estimated to arrive in November and shipping within the US takes about a week then we can expect to have them by early December. Oooooo the anticipation is building I'm excited. My Delta Six Rifle and HTC Vive are ready to get some full immersion DOOM and games going haha! It's exciting to see movement. I think a few did get emails though I was talking to peeps on Facebook that are within the top 230 and they claim to have been told their units are currently being shipped over freight and that was a few days prior to the posting of the latest production update. I'm pretty sure the shipping cost is for the shipping from China to US to your house or distribution center whichever you elect for, but I could be wrong. Congrats. You're right about delivery if you're in the first 1000. I actually was commenting about the total orders of Omnis and when everyone can expect to have it delivered to their homes. Too bad it's impossible for air delivery; it would cut the time to a fraction of sea delivery--but the cost would be HUGE! 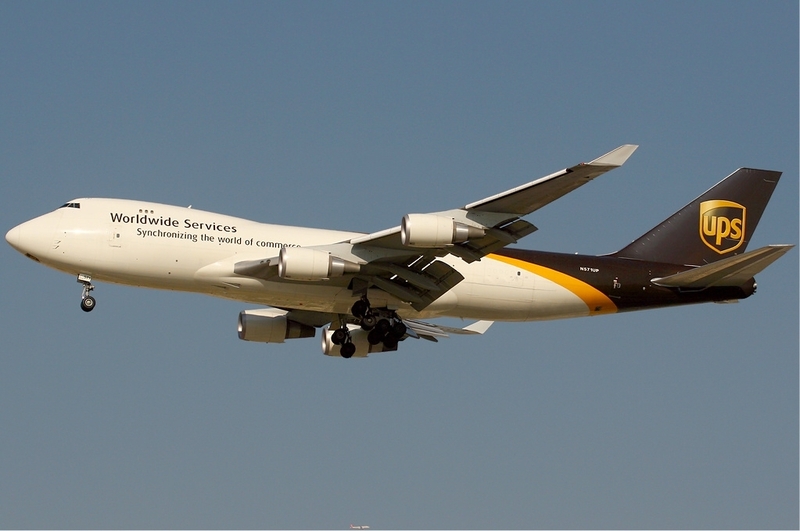 Too bad it's impossible for air delivery; it would cut the time to a fraction of sea delivery--but the cost would be HUGE! That would be amazing, it's not impossible either it's just way to pricey to be practical as you mentioned. @DanteM & @Sponge101 - I now am carrying the mental image of a giant bomber class jet flying over the US and dropping the crates directly on their destinations. Okay, NOW I'm imagining it without chutes. HAHAHA!! That's epic. Just crates of omnis crashing through roofs and landing on cars everywhere haha. 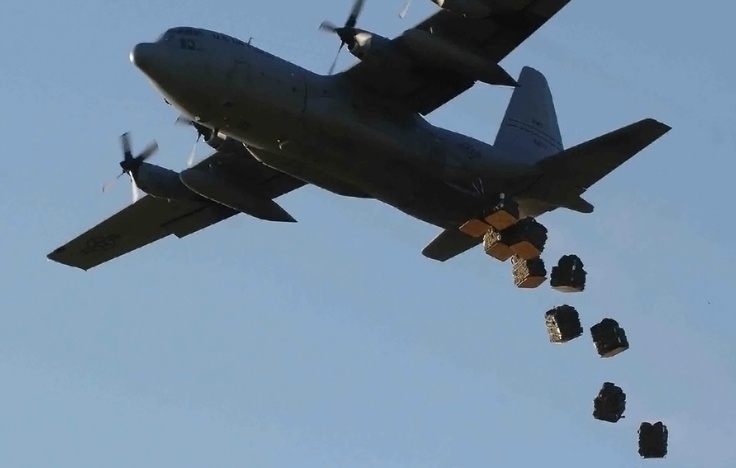 I was more of thinking flying them in on a cargo plane and the loading them onto trucks but I like the Image of a C130 dropping cargo everywhere haha. That would be an airdrop. Air-delivery/air-transit was what I had in mind. Well backers that are in the US and within the first 1000 such as myself should have theirs long before Xmas. Anyone know if the emails are being sent out when they ship from China or are the emails being sent out for when they ship within the US? I'd imagine if they are being sent out during the overseas shipping phase then we would see a few reporting the joy of seeing their emails since the first batch has shipped already. Why would Virtuix send out the emails when they don't actually have the units in? Not trying to jinx things, but there's a lot that can happen in the month or two that it'll take for them to ship to the US. I suspect that when the first units arrive, Virtuix will want to do an extra inspection to make sure that nothing was damaged during the trip and then they'll be ready to send emails out. That's why I'm asking, cause technically the overseas shipping is still part of the shipping phase. So I wanted to clarify if the emails are suppose to be going out when they ship or once they arrive state side and are prepping for in country shipping. I've just gotten news friends. Our Omni Decks have been teleported to the Cyber Realm and we must go into the Cyberverse to save them from the EVIL FORCES of COMPUTER CHAIR! The evil computer chair faction of the inner internet got wind of our plan to liberate the user from their tyranny and have hatched an evil plot to eliminate the Omni threat to computer chair superiority! Roll D 20's for Dex, Strength, Int, and Constitution. Usually it's 4 D6 and you can take out the lowest roll for each. Also if you're skipping Wisdom and Charisma, you should skip Intelligence too, unless you're using it as a general stat for mystical or psychic energy. With your D20 rule, I got 11S, 16D, 13C, and 2I, but I don't think I can deal with being that stupid, so 2S, 13D, 11C, and 16I is more suitable. If you allow for a single reroll, then I manage to switch out my 2 for an 18, at which case I'd be fine with 11S, 16D, 13C, and 18I. Are you planning to make this into a game of tabletop in AltspaceVR? Usually it's 4 D6 and you can take out the lowest roll for each. The most common methods in D&D 5e is you either pick your points by alloting 15, 14, 13, 12, 10, 8 and place them where you want OR you roll a D20. I think the 4 D6 was 3.5e wasn't it? I've never heard of anyone in 5e doing that method. That reminds me tomorrow is D&D night oh have any of y'all tried the tabletop simulator in steam with the Vive or oculus? I hear it's quite fun. I have tabletop simulator, but I haven't tried it out in VR just yet. So far I've only managed to catch a single tabletop session in AltspaceVR, but that was really fun and I'm hoping to catch another session this weekend. That sounds like a really horrible way to do stats, rolling the D20 is more likely to average you out at 10, but your alternative is to have no shot at anything over a 15? Do you get any rerolls on the D20 method? Even just a pick 1 or 2 lowest stats to reroll would raise the average score to a more reasonable 12 or 13 instead of the 10 that it currently stands at. I guess it's not too terrible as long as you still get a stat boost every few levels, but I don't usually start out my characters with anything less than a 16 in my prime stats. I thought the point buy system that NWN/NWN2 used was reasonably balanced. I wonder why they didn't stick with that? @gleamingsands and @DanteM - I'm going to flag this thread so one of the mods can trim the post where this completely derailed from topic. Hopefully they can move it into its own thread somewhere and we can keep talking. @GreyAcumen I was just going with what I could remember, couldn't think of wisdom and charisma at that moment. I've actually been thinking of running a campaign to get some experience dm'ing. Might do it via roll 20, although I do have tabletop.